The currency of Nepal is called Nepalese Rupee in English or Nepali Rupayiaah in Nepalese language. It is different from the various other Rupees that are prevalent in the Indian sub-continents such as Indian Rupee, Pakistani Rupee or Sri Lankan Rupee. The Nepalese Rupee has a photo of its Excellency printed on it or minted in case of coins. The smallest unit of a Rupee is called Paise. 1 Paise is equal to 100th part of 1 Rupee. The coins are generally in 5 denominations, 10 Paise, 25 Paise, 50 Paise, 1 Rupee and 2 Rupees. The currency notes are of various denominations. The smallest denomination is 1 Rupee note. Apart from that, you have 2 Rupees, 5 Rupees, 10 Rupees, 20 Rupees, 25 Rupees, 50 Rupees, 100 Rupees, 500 Rupees and 1000 Rupees currency notes. 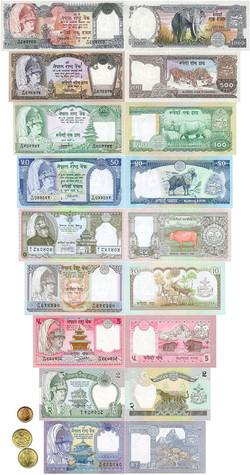 The Nepalese currency is universally recognized and can be converted in any currency. It is a fully convertible currency. This can be done at money-exchanges. There are lots of money-exchange centers in Nepal. This includes both Government affiliated and private operated ones. You can find money-exchangers in every corner of big cities such as Kathmandu and Pokhra. In smaller towns too, there are solitary money exchangers. Try to deal with the government affiliated ones if you don't know the nuances of money exchanging but if you have done the minutes then it is better to deal with private operators. Of course it is not bad if you save a couple of Dollars.